The Justice League Watchtower is badly damaged, with several of the team unconscious. Cyborg's machine side initiates a search to transport the Trinity but he has to scan the planet first. Clark has taken Diana and Bruce to see Devil's Mouth Falls, where he reveals to the team that when they were trapped in the dream world and encountered White Mercy they saw a carving of their emblems. Somehow they've appeared in the real world and that means White Mercy was more than a manifestation of the dream world. Mercy was real and they left her behind... no time to ponder as Cyborg locates and 'Booms' them into space. As the trio arrive they discover the breach and a terrified Vic literally being torn apart by some kind of alien being. They soon discover huge constructs in the base and Superman reveals there are egg sacks in them with living beings inside. 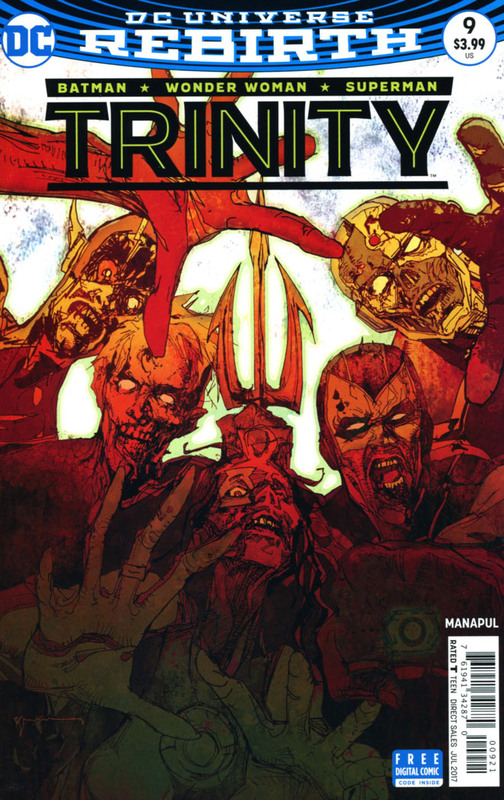 Simon Baz and Jessica Cruz appear and attack the Trinity possessed by the alien beings. The Green Lanterns send Superman and Wonder Woman floating into space while Batman clings to the unconscious torso of Vic. Flash appears and helps Batman telling him of how the Watchtower became some kind of H.R. Giger-esque monstrosity. Superman and Wonder Woman find an opening from the outside and sneak back on board, but what greets them holds a terrifying surprise! Story - 5: Was this timed to coincide with Alien :Covenant? If I were cynical I'd say so but I am enjoying this second arc leading on from 'Better Together'. 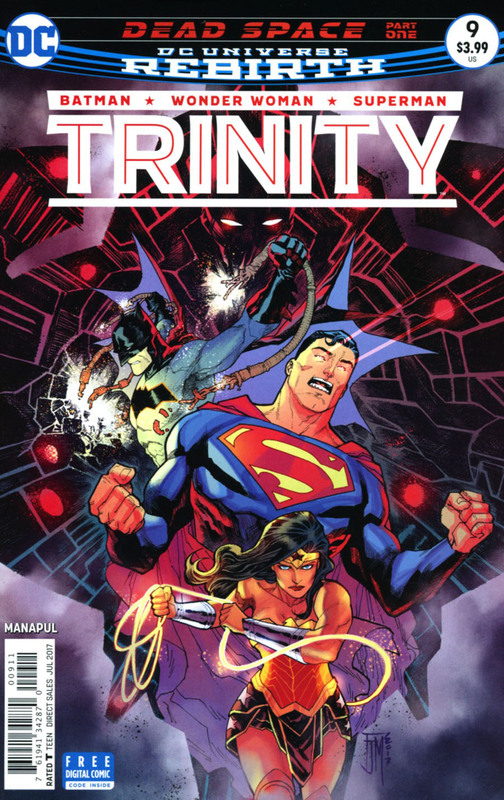 I like that there is a reason for the Trinity to team up here that doesn't feel forced. Team-Up books often suffer from coincidence or convoluted means to join forces. Happily Manapul proves that his first arc wasn't all he had up his sleeve. I like the horror element with aliens capable of overpowering even a Green Lantern. The three heroes also comfortably share the spotlight with none hogging the limelight. It is refreshing to see Wonder Woman and Superman getting an equal share. Art - 4: The art continues its unique styling and though it remains strong, there aren't as many of those amazing action splash panels that Manapul is famous for and his premiere arc was filled with. The palette is also somewhat muted which also dampens the artwork's strengths. Cover Art - 5: Eye catching, powerful and with all the thrills of a movie poster. This shows you exactly why the Trinity are DC's best. Manapul crafts some truly stunning art. Variant Cover Art - 5: If there was any doubt this is a horror storyline this cover cements it. The possessed League look truly terrifying. Chilling!